For a word on our approach and how you can contribute to the project, continue here. On the Main Page below are general news and some select incidents studied at ACLOS since its creation in 2012. For more current analysis, check "Recent changes" or "New Pages" in the menu to the left, or use the search box. 20 Apr. Firat News Agency publishes an interview with a Rojava official about the future of the 11,000 male ISIS fighters and 72,000 family members that are in prison resp. camps after the defeat of the terror cult. 19 Apr. A high-level Russian delegation visits Saudi Arabia to discuss Syria with Crown Prince Bin Salman. After that, the delegation heads to Damascus to meet Assad. 17 Apr. After Iranian foreign minster Zarif had a "long" meeting with Assad the day before, he is now in Ankara to brief Erdogan on the results. 16 Apr. Brazil and India reopen their Syrian embassies. 12 Apr. It is reported that differences between "Assad and armed opposition" over composition and nature of the constitutional committee have been narrowed down. The 150-member body would be split equally between representatives chosen by the Syrian government, the Syrian opposition and Syrian civil society, with 50-members each. The Syrian government was not allowed to object to the names of the representatives of the opposition; with the rest of the body, it is said that "Assad's regime has given its consent to all names but four". 7 Apr. The German capital Berlin's district of Kreuzberg - known for its multi-cultural and leftist milieu - starts the first city partnership between a German and a North-Syrian city partnering with the city of Derik, where the Rojava parliament is located. Several other city partnerships are in the planning stages. 4 Apr. The Venezuelan foreign minister visits Assad and Moallem in Damascus. 27 Mar. Close to midnight Israel attacks several targets they claim are Iranian weapon depots on the outskirts of Aleppo with air-to-surface missiles fired from jets outside of Syrian airspace. 23 Mar. The SDF declares "the military victory over ISIS after six years of continuous war and great sacrifices." 22 Mar. Interdepartmental coordination headquarters of Russia and SAR issued a statement "On measures to eliminate the Rukban camp for internally displaced persons" , seeking to close the camp while working with tribal leaders, US and Jordan (robo-translation). 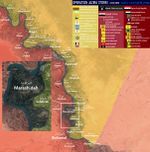 Cassad: "Fighting at Bagous, 22.03.2019", published 23 Mar., reports some continued fighting. 21 Mar. Trump recognizes "Israel's sovereignty over the Golan Heights". 20 Mar. All over the region, people are celebrating Newroz, the start of the new year/spring at the astronomical spring equinox. Following the resignation of long-time president Nursultan Nazarbayev, the parliament decides to rename the capital city of Kazakhstan and host of Syria talks from Astana to Nursultan. 19 Mar. The SDF says it "fully" controls the ISIS "tent city" in Baghouz now, but some gangs unwilling to surrender seem to hide on the banks of the Euphrates (pics and vids). Russian defense minister Shoigu meets Assad in Damascus to discuss the fight against terrorism and other topics. According to the MoD, he also delivered a message from Putin. 18 Mar. Assad receives a high-ranking joint Iranian-Iraqi military delegation including the chiefs of staff of both armies to discuss cooperation in the fight against terrorism. 17 Mar. An SDF statement gives numbers about the Baghouz fight, but doesn't declare it finished. According to this, 29,600 ISIS members (incl. families) surrendered and 1,306 were killed, while the loss on SDF side is 11 fighters. Turkey opens a new border crossing connecting Hatay province with the Syrian Afrin canton in the Jandaris district. 12 Mar. A joint Russian-Syrian statement again points out the grave situation in Rukhban camp and calls on the US to let the prepared convoys in. It mentions that without the cross-border efforts of the Jordanians there would be no water supply at all, and that satellite footage shows several new mass graves in and near the camp. While "hundreds" of ISIS fighters have surrendered in Baghouz during the last 48 hours, the "endfight" is still going on. 11 Mar. According to Turkish AKP-friendly Yeni Safak newspaper, the US has interrogated 2000 ISIS fighters and given 140 of them new identities and passports. ISIS leader al-Baghdadi is in US custody according to the paper which opens the article with a picture allegedly showing him in a US military vehicle (of which ISIS has taken over plenty in the conquer of Mosul). 10 Mar. It looks like the remaining ISIS fighters under siege in Baghouz are finally preparing to surrender. Assad receives a Chinese delegation headed by the assistant foreign minister. 9 Mar. The Russian MoD again complains that the US is sabotaging the Syrian-Russian attempts to evacuate the civilians willing to return home from al-Rukhban camp where the conditions are "disastrous". 8 Mar. Joint Turkish-Russian military patrols along the border of the Idlib deescalation zone start today with the Russians patrolling the outside and the Turks the inside. 7 Mar. The UK MoD is ridiculed for its claim, answering a FOIA request, that in their air attacks against ISIS only a single civilian died while 4,013 "targeted individuals" were killed and 302 wounded. 5 Mar. Andre Vltchek publishes his report from the Idlib frontlines. 3 Mar. Russian MOD via TASS (Eng.) (Rus): US forces in Syria bar entry to convoys sent to transport refugees from the Rukban camp to their pre-war locations. 28 Feb. The situation in Baghouz remains unchanged, although the surrounded remains of ISIS have let go some more civilians, likely due to food shortages, and the SDF says it rescued 24 of their fighters who had been taken as hostages by the terror cult. In the evening ANHA reports that around 200 fighters and their families have just surrendered. Wladimir van Wilgenburg is in Raqqa and tweets some impressions from the former ISIS capital including from the already renovated central square. 27 Feb. Russia and Syria accuse the US of preventing refugees from leaving the al-Rukhban camp in the shadow of their al-Tanf base to return home. 25 Feb. Assad visits Tehran and meets Khamenei and Rouhani. 22 Feb. The US now says it plans to keep 400 soldiers inside Syria, half of them at al-Tanf and the other half in Rojava. 17 Feb. Assad gives a speech to local lawmakers from around the country. The US military warns the Kurds that it will "have to" stop any assistance to them in case they "partner" with the Syrian or Russian governments. 16 Feb. Afternoon: According to the SDF, ISIS is besieged in a tiny spot of a few hundred square meters but still holds many civilians as human shields, so the operation isn't finished yet. Meanwhile, the SOHR has already reported that the remaining fighters have surrendered and the pocket, and with it the caliphate, is history. 14 Feb. Putin, Erdogan and Rouhani meet in Sochi for a trilateral summit on Syria. 13 Feb. For the first time in weeks, ISIS releases battle footage from the fight in the former Hajin pocket. Meanwhile, they are trapped in a 1 km² area and have been given a 24 hours ultimatum to surrender by the SDF. Germany arrests two Syrians on refugee status accused of being involved in systemic torture operations by the government between 2011-2012 allegedly documented in the Torture Photos from "Caesar". 12 Feb. SANA accuses the US-led "coalition" of having killed almost 100 civilians in two air attacks on refugee camps near the last ISIS-occupied territory in al-Baghouz village in the former Hajin pocket. It is said that an attack with explosives, attributed to IS, has targeted the headquarters of the French military intelligence in Raqqa (no independent confirmation or coverage in mass media; picked on Cassad). It is also reported by Iranian PressTV, by Sputnik in Arabic, and by Lebanese media. It is unclear where those news originate. More strange claims about it here, in French. 1, 2. 11 Feb. The Russian defense minister visits his Turkish counterpart to discuss Idlib ahead of the trilateral meeting including Iran planned for February 14 in Sotchi. 10 Feb. The SDF rescues around 200 civilians used as human shields by ISIS in al-Baghouz village and sends them to refugee camps in the area. 8 Feb. According to British media, alleged ISIS leader al-Baghdadi has fled the Hajin pocket to a desert hide-out after an attempt to kill him by a rival among the "500 remaining fighters" failed. 6 Feb. According to SANA, the Turkish army has transported 1500 foreign jihadists from Turkey into Idlib province in recent days. 5 Feb. Apparently Erdogan still has no success in convincing any other power of his idea about a buffer zone inside northern Syria. 4 Feb. ISIS remains again try to flee the Hajin pocket to Iraq and are stopped by the PMU. The US State Department calls on foreign nations to take back their citizens among the now over 800 ISIS fighters the SDF is holding captive. Elijah Magnier explains why the claims by Western analysts that ISIS could return when US troops leave are wrong. 3 Feb. The US air force attacks a SAA artillery position near al-Bukamal west of the Euphrates. Shortly after, the position is attacked by ISIS ground forces. 2 Feb. According to SOHR, 700 recently arrived US Special Forces are searching SDF-controlled areas for ISIS fighters and leaders who fled the Hajin pocket. The YPG captures alive the known German ISIS torturer Martin Lemke and his two wives. 1 Feb. A certain Dr. Neshat Dihile on Egyptian TV shows alleged Turkish state documents of a plan that amounts to genocide against the Kurds. Today Firat News Agency publishes an English translation of the alleged secret plan. Iraqi media reports that the PMU have killed a group of ISIS fighters that tried to flee the Hajin pocket to Iraq. 31 Jan. SANA reports that a ten truck SARC human aid convoy was prevented to reach Hajin town by a local militia who say they were ordered by US forces to keep the convoy away. 30 Jan. Following the release of Leyla Güven, a statement in support of her and many others on hunger strike for the end of the isolation of Abdullah Öcalan is signed by hundreds of intellectuals and read in front of the German Parliament. A Turkish military delegation is heading for Moscow to discuss Syrian matters tomorrow. 29 Jan. Reports that the SDF has asked Hezbollah to mediate in the negotiations with the government are declared untrue by its spokesperson. According to Firat News Agency, the remaining ISIS fighters in the Hajin pocket demand that they get a "corridor" to move to Idlib over Turkey, otherwise they would harm the civilians they hold as human shields. The SDF reportedly refused. France takes back 130 French ISIS fighters hold captive by the SDF to put them on trial. This makes it the first Western country to answer the SDF calls to take their captured ISIS terrorists back. 28 Jan. Syria and Iran sign a number of agreements, among them about long-term strategic economic cooperation. 27 Jan. Asma al-Assad continues her cancer treatment and underwent a successful surgery. 26 Jan. The ISIS fighters remaining in the Hajin pocket show no signs of giving up. The YPG releases a statement commemorating the fourth anniversary of the liberation of Kobane. 25 Jan. Activist Leyla Güven, who has been on a 79 days hunger strike demanding the end of isolation for Kurdish leader Öcalan, which has sparked solidarity demonstrations all over Europe, is released from Turkish prison. 24 Jan. A "solidarity pause" in front of the Venezuelan embassy in Damascus is attended by many political and public figures after the government had already condemned the "flagrant interference" in Venezuelan affairs by the US and its satellites. 23 Jan. Reports come in that after further SDF advances in the Hajin pocket, parts of the remaining ISIS fighters have surrendered, which led to the securing of many civilians. The remaining gangs are now reduced to the territory of a single village at the Euphrates, Marashidah. Erdogan is in Moscow to discuss northern Syria with Putin. Elijah Magnier sums up the situation. After former US anti-ISIS envoy Brett McGurk said in a CNN interview on Monday that Turkey has provided ISIS "with everything they needed" over the years, PYD's Salih Muslim points out that this is obviously true, but not news to anybody who followed the events in Kobane. 22 Jan. Bashar al-Ja'afari calls on the UN to stop the constant Israeli attacks in violation of international law and invokes the prospect of "symmetric" retaliatory attacks on Tel Aviv airport. 21 Jan. Another Israeli air attack on targets near Damascus takes place. Jordan opens the main Jaber border crossing with Syria for the first time in three years. 20 Jan. A Syrian delegation attends a bilateral private sector forum in Abu Dhabi. 19 Jan. Russian military police said to be on patrol in Manbij -Cassad (photos). Hawar News Agency publishes a ten points list it says it obtained from Kurdish sources that represents their position in the negotiations with Damascus over the future of Rojava. 18 Jan. DIA civilian killed in Syria identified; Green Beret, two language specialists, SEAL-turned-DIA civilian among dead in ISIS-claimed bombing in Manbij, Syria; Trump meets with families of soldiers killed in Syria. 17 Jan. The SDF takes Al-Susa in the Hajin pocket and reduces ISIS to a territory of four villages. 16 Jan. Unsurprisingly, the idea of a Turkish-controlled "safe zone" along the border on Syrian soil, brought up by Erdogan for years and now picked up by Trump, is opposed by the Kurds, Damascus and Moscow. 15 Jan. According to Arab media, the PMU have stopped a US military reconnaissance mission in Anbar province border region and forced them to return to their base. 14 Jan. Alexander Yefimov becomes new Russian ambassador to Syria. 13 Jan. Trump tweets "Will devastate Turkey economically if they hit Kurds." Several gulf airlines are briefed on the situation at Damascus airport in preparation for a resumption of flights. According to the Syrian govenment, negotiations between them and the Kurds about resolving the situation in Rojava have "intensified". This seems to be confirmed by a statement from PYD co-chair Shahoz Hesen. 12 Jan. Another Israeli attack on targets near Damascus ends with most missiles intercepted. As part of the surrender agreement, HTS is now in control of the Taftanaz airbase. 11 Jan. Italy considers to re-open its embassy in Damascus. According to a US military spokesperson, the withdrawal from Syria has begun. 10 Jan. After HTS scores several victories in the Idlib-internal "rebel" war, the Turkish-backed gangs basically surrender and agree that those areas will be run by the HTS' "salvation government" in the future. 9 Jan. At a joint press conference with his US counterpart, the Jordanian Foreign Minister demands that Israel returns the Golan Heights to Syria. 7 Jan. Heavy snow falls in several parts of Syria. 6 Jan. The winners of the Syrian Science Olympiad are honored in Damascus. HTS keeps on advancing against Turkey's proxies in Idlib pocket after the Zenki group was defeated and had to retreat to occupied Afrin. 5 Jan. Under heavy bombardments by US-coalition jets, ISIS withdraws from the town of al Shafa in the Hajin pocket. Five fighters are captured by the SDF, among them one from Ireland and two from the US. 4 Jan. Heda Saratova, member of Chechnya human rights council, says that women and children, including at least one woman-a mother of many children and a child with Russian citizenships, from Chechnya, were killed, and more injured, in US-led coalition airstrikes in IS-held Deir ez-Zor area during the holidays. Asks for a corridor for women and children to leave. (Rus.)(Robo-Eng). 3 Jan. The "rebel" war between HTS and Turkey's proxies is now raging over the whole Idlib pocket. A SOHR summary counts casualties in the hundreds over the last three days. The Iraqi airforce attacks another ISIS meeting in Hajin pocket, killing seven leaders. 2 Jan. Several hundred YPG fighters withdraw from Manbij city. Meanwhile, Turkish-backed "rebels" are reported to withdraw from the surrounding frontlines. Firat News Agency interviews TEV-DEM Diplomacy Officer Aldar Xelil about the situation in Rojava and their relationship to international forces and the Damascus government (two parts). Jaysh al-Islam, who were green-bused from the eastern Ghouta to Afrin canton, declare their intent to move south and join the "rebel" war in the Idlib pocket fighting their old rivals al-Qaeda/Nusra/HTS. ISIS forces in the Hajin pocket cross the Euphrates and attack a SAA camp, killing 20+ soldiers before fleeing in the direction of Homs desert. Meanwhile on the other side of the river, the SDF is still advancing against the cult. 1 Jan. In a new round of the inter-"rebel" war inside Idlib pocket, al Qaeda captures several towns and villages from the Turkey-backed Nouredine al-Zinki group after the latter had killed a couple of fighters of the former. A running theme in Syria news is claims about the use of chemical weapons and the red lines they would cross, if confirmed. Our category on this topic covers most reported incidents, especially all high-profile ones like the one that almost started a world war. In 2013, the allegations mostly involved the use of the nerve agent sarin. Since Syria surrendered its stocks to avert war, the allegations from 2014 to present shifted to use of chlorine gas. In both phases, ACLOS has discovered many problems with the accusation of government CW use, as well as much evidence that opposition forces are the ones actually guilty for many incidents. This trend continued when in early April 2017 the topic hit big news again, just to return once more a full year later. Around 20 or perhaps 30 civilians are killed in in an attack on an aid convoy near Aleppo, destroying more than a dozen trucks hauling medical aid. This is another disputed incident; the West and its sponsored activists alleges a Russian or Syrian air attack is to blame, while Russia and Syria don't seem to know exactly what happened. ACLOS investigates. And not to be distracted: this came just two days after the US airstrike on SAA in Deir ez-Zor that killed at least 60 Syrian soldiers in a well-known position of theirs, in a rather implausible "accident." The initial ACLOS investigation. The murder of around 108 civilians, among them up to 49 children, in the town of Taldou belonging to Houla in Homs province, is maybe the most famous event that happened in Syria in 2012. It was immediately blamed on the government and led to several countries expelling their Syrian ambassadors. Initially attributed to the use of heavy weapons, it quickly turned out that most of the victims were killed by short-distance violence. This led to the blaming of Alawite "Shabiha" militias loyal to Assad. While the UNHRC closed their investigation in mid August stating to be reasonably certain that indeed government loyalists were the perpetrators, a lot of the conflicting evidence collected in our research was either washed away or not considered at all, while contradictions in the testimonies of witnesses backing their conclusion were denied. A central question is who was in control over the area at the time - our attempt to answer this based on all collected evidence can be found here. 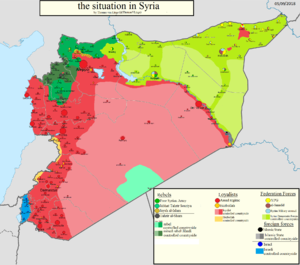 Although relatively secure by now, the city districts and rural surroundings of Homs were home to some of the most shocking massacres of the Syrian war, especially in early 2012 when rebels had control over most of the city (that was following a short-lived Syrian military withdrawal brokered by the U.N. and Arab Laague). The ongoing ACLOS effort to list and analyze as many massacres as possible, so far includes more than 40, accounting for at least 1,400-1,900 deaths of almost strictly civilians victims. Alleged details are compared with common family names, district demographics, and the usual ACLOS techniques, to establish useable insights. Consider the Khalidiya Massacre of February, 2012, with 138 people killed, rebels said, as family homes were shelled. But the victims were 100% male and 94% adult, pre-segregated just like the prisoners of rebels the other side claimed the victims were. And this one's no fluke; strangely similar patterns repeat over and over in what makes for chilling reading. 21 Apr. Poroshenko accepted elections loss, with exit polls 73 to 25 in favor of Zelenskii. DPR medic Lilia Egamberdieva. Killed 19 Apr. 19 Apr. At 18:00, two Ukrainian RSG groups attempted to penetrate DPR defence lines near Oktaibrskoe. They were discovered. Part of the group detonated on a minefield, killing 3 and wounding two. It is said that (overall?) 4 Ukrainian soldiers killed and 5 wounded. DPR losses, 3 killed. 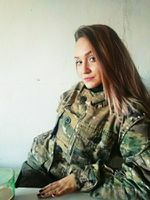 A female medic, Lilia Egamberdieva, tried to rescue two heavily wounded DPR soldiers; eventually she called fire on herself firing from a machine gun at a distance from wounded soldiers. All 3 were killed after a massive Ukrainian strike. Live stream presidential debates, Olimpiisky stadium, Kiev, starting at 19:00 in Kiev (video with Russ. transl. ), (Rus. text). Another debate was scheduled at a TV station, 21:00; but Zelensky did not confirmed attendance, and eventually Poroshenko debated himself. 18 Apr. Zelensky interview to RBK Ukraine, discussed in Talk. Court in Kiev ruled that nationalization of Kolomoiskyi's "PrivatBank" was illegal. Bank of Ukraine disagrees and will appeal. 17 Apr. Ukrainian MP Rybchinsky: "Poroshenko is preparing a coup." Lutsenko provided details of the meeting with US Amb. Marie Yovanovitch, which he earlier described as receiving a 'do not prosecute list'. In his new detailed version, they had a heated verbal exchange with Yovanovitch, after her comments that prosecution of a certain anti-corruption activist undermines public trust in such activists. 15 Apr. Nadezhda Savchenko and respected Ukrainian negotiator Vladimir Ruban, accused of plotting against the Ukrainian authorities and arrested in March 2018, have been freed by a court decision in Kiev-reports + videos 1, 2, 3. 14 Apr. Poroshenko "debates" himself at the 'Olympiiskii" stadium, as he and Zelensky could not agree on the debate time + venue (stream). 9 Apr. DPR MoD: a soldier was killed by Ukrainian mortar fire. DPR returned fire using 'non-prohibited weapons', destroying firing positions of the adversary. Reportedly 4 UAF soldiers were killed and 3 wounded. It is said that 'Azov' regiment and 'Aidar' assault battalion arrived to Donbass, to the zone of responsibility of 53 mechanized brigade, UAF, near Gorlovka. Those nationalist forces are said to be responsible for the shelling of Golmovsky settlement from BMP which resulted in loss of electric power for 3000 civilians, and damaged a house; a civilian woman was wounded earlier in Zaitsevo. DPR returned fire and "destroyed the BMP"; it is said that one man called Mikola Nezhivyi is killed and 2 heavily wounded. In Ukrainian version of events (video, TSN.ua), Mikola Nezhivyi was killed near Avdeevka. They were firing on DPR positions from easel anti-tank grenade launcher; DPR responded with anti-tank missile, killing him and wounding two others. Also reported: near Zaitsevo, during de-mining of the area near the water supply of the pump station Seversky Donets - Donbass, one Ukrainian sapper was killed when a mine exploded, two others were wounded. Poroshenko speaks Russian, Bulgarian, Romanian, Polish, trying to get reelected (but it is 'too little too late'). 8 Apr. DPR MoD: as a result of Ukrainian forces shelling of Zaitsevo and Staromikhailovka, two civilian women are wounded. DPR returned fire using 'non-prohibited weapons'; reportedly 3 UAF soldiers were killed and 1 wounded. 7 Apr. DPR MoD accused Poroshenko and 79 separate paratroopers assault brigade, UAF, of an attempted provocation, aimed to raise Poroshenko's reelection chances. At 8:30, two reconnaissance and sabotage groups, 15-20 men each, advanced in the direction Pishevik-Oktaibr'. One group was tasked in provoking DPR to return fire, while the other group task was to 'ensure' civilian casualties at 'Oktiabr' check-point , with DPR blamed for those deaths. The RSG groups were discovered early and fired on. Losses are being verified. 4 Apr. After floating several excuses not to do it, Poroshenko eventually responded in kind and accepted Zelensky's strongly-presented challenge to debate at a stadium, in a carefully staged video of his own. Drugs/substances test is expected, with details negotiated. 3 Apr. Yesterday Ukraine cut water supply to Dokuchaevsk and Yelenovka, affecting 25,00 people, despite the fact that targeting civilian infrastructure or utilities is a war crime. 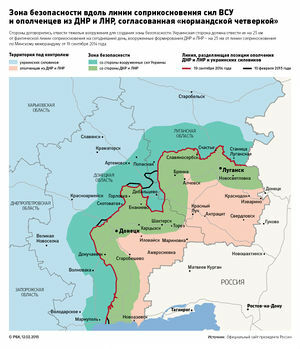 Noted, according to a later report, water supply to Dokuchaevsk was restored, at 7 p.m.
NATO sends ships on a visit to Odessa, discuss accompanying Ukrainian ships to stage another provocation in Kerch straights, which may be seen as a fruitless attempt to lift fortunes of the failing Poroshenko reelection campaign with this demonstrative Western backing. 2 Apr. Timoshenko says (1, 2, video) that "Poroshenko falsified elections regarding his result", but she will not challenge the results in courts, as she does not have trust in Ukrainian courts, as they are. With this, Zelensky and Poroshenko advance to the second round. Timoshenko won't back either of them (earlier Zelensky denied reports that negotiations giving Timoshenko a significant role in the government are on-going). 1 Apr. On April's fool day, Ukraine's decision not to renew friendship treaty with Russia comes into force. Election committee stream. Polls closed, with 45% voting participation figure at closing time (and big jump into mid-60% range for the final count). Right after closing, 'two sociological companies polls' were announced , with 20:01 on the clock (exit polls? ), Zelenskii 30.4, Poroshenko 17.8, Timoshenko, 14.2. Another exit poll by 112.ua shows similar results. Two top candidates will advance to the second round. Half a million of Ukrainian voters were placed on ballot lists abroad, and 101 polling stations were opened in 72 countries, including Congo and Kosovo (Ukrinform), but not Russia where almost 3 million Ukrainians live. At the end of last year, Kiev refused to open polling stations in Russia. A former Aidar commander Melnichuk posted a list allegedly naming 'unprosecutable Ukrainians' , said to be given by US Amb. Yovanovitch to Ukr. Prosescutor-Gen. Lutsenko. This list appears to emerge on social media. (Updated on 17 Apr. version, some pressure but not a list). 29 Mar. DPR ombudsman: in the past week, 4 DPR soldiers were killed, 1 soldier wounded. DPR MoD: In the past week, 79 ceasefire violations by Ukrainian forces, 21 settlement shelled using 152 mm artillery, mortars, tank and BMP guns, grenade launchers, large caliber machine guns, amd small firearms. During OSCE inspections, heavy Ukrainian armaments, including 3 "Buks", 1 "Osa", 9 T-72 tanks, 2 "Konkurs" anti-tank complexes, were not at designated locations, in violation of the Minsk agreements. "Quiet period" before the first round of elections in Ukraine. Past polls (summary). consistently show Zelenski in the lead, with Poroshenko and Timoshenko competing for the second spot. 24 Mar. DPR MoD: Ukrainian forces shelled Sakhanka. DPR returned fire. 2 DPR soldiers were killed; 2 Ukrainian soldiers were killed and 3 wounded near Novomikhailovka settlement. 23 Mar. DPR MoD: Ukrainian forces shelled Kominternovo and Leninskoe, electric power line and 3 houses were damaged. DPR returned fire, suppressing Ukrainian firing positions, using weapons not banned by Minsk agreements. DPR MoD warns about Ukrainian provocation plans with elections approaching and Poroshenko on track to lose. According to DPR MoD, such plans include provocations against OSCE observers, or causing mass civilian casualties on Ukrainian-controlled territory, in particular at a check-point Zolotarevo, which is set to open, but is said to be mined. Ukraine reports one killed and one wounded soldier on Mar. 22, and alleges that 3 DPR soldiers were killed and 5 wounded (not confirmed). G7 writes to Avakov about extremists threatening elections (RFE/RL), (Rusvesna). Avakov claims that radical groups has been warned. 21 Mar. DPR MoD. 7 ceasefire violations by Ukraine in the past day, one DPR soldier killed. As a result of shelling of middle school 116, 2 unexploded munitions were found, schoolchildren evacuated. DPR returned fire. It is said that 2 Ukrainian soldiers were killed and one wounded as a result. Gallup: World-low 9% of Ukrainians confident in the government, low confidence in elections, high confidence in government corruption. 20 Mar. The Ukrainian prosecutor general Yuriy Lutsenko tells US media that at their first meeting after he took office (in 2016), he received a "do not prosecute" list from US ambassador to Ukraine Marie Yovanovitch. He also complained about his office not receiving 4 mln $ in US assistance. His claims and the response ("assistance redirected") are here. (Updated on 17 Apr, some pressure, but no list). Ukrainian media: it is strange that the case of Sytnik and Leshenko interference in the US presidential elections (leaking pre-trial information on Manafort) only came to light now. 19 Mar. DPR ombudsman. In the period of 1-14 March, 6 people were killed (4 of them soldiers), 5 people were wounded (4 soldiers and a civilian man). 11 Mar. Six settlements in Novoazov region, DPR lost electric power on Mar. 7 due to Ukrainian shelling. Ukraine still did not respond to requests of ceasefire regime to conduct the repair work. 10 Mar. DPR MoD: despite the agreed Spring ceasefire, DPR soldier was killed by Ukrainian sniper fire. DPR appeals to international human rights and humanitarian organizations 'to record the murder and to assist in bringing those responsible to justice'. Also, Ukraine fired but missed 'Fagot' anti tank missile on control rooms of Vasilievka water pumping station. This water pumping station is a very important one, and its destruction or stoppage will cut water supply to over 40 settlements with a population of 1.8 million people and will inevitably lead to a humanitarian catastrophe. DPR appeals to OSCE to record the incident and to pressure Ukrainian military to observe agreed ceasefire. 9 Mar. Group of nationalists clashed with police at a meeting in Cherkassy where Poroshenko spoke; 15 policemen were injured. Nationalists were trying to question Poroshenko (on thefts of military supplies, etc), however Poroshenko hurriedly left when clashes started. Russian and Ukrainian sources report details of Merkel refusal to follow US request to deploy ships to support Ukrainian passage to Kerch straights. Israeli Solomon Mann in a Facebook post in Russian (apparently) gives those details from a restricted account of a German politician: Merkel to Ursula von der Leyen: You talk like children!" , " you assume that Putin will not undertake anything and will watch how we defile in the strait. And if he does with our ships the same thing that he had already done once with the Ukrainian ones? What are you suggesting, for Germany to fight, Madam Minister? Why should we neglect the interests of Germany for the sake of the interests of the United States? ... ". Frau Chancellor also referred to a letter from France, where Macron warns Merkel against "rash steps" on "incitement from the USA." 8 Mar. Another ceasefire has been agreed from Mar. 8 ('international women's day'), however 5 ceasefire violations are reported overnight and in the morning hours. More reports (amplified by Russian media) of Poroshenko's erratic behavior with elections approaching. 4 Mar. DPR MoD: A civilian man is killed by UAF shelling of Sakhanka. DPR returned fire, suppressing UAF firing position "with weapons not banned." 2 UAF soldiers reportedly killed, 3 wounded. One DPR soldier is killed and one wounded. Niura N. Berg in a Russian RIA article: Zelenskii is leading but his upward potential is limited. Poroshenko is gaining (and has unmatched admin resources). Timoshenko is fading. (Recent poll here). 2 Mar. Ukrainian forces fired 6 mortar shells on Kominternovo, a residential home (Akhmatova 47 St.) was destroyed. 25 Feb. Car explosion is reported in Makeevka, said to target DPR commander, who is said to survive. 24 Feb. DPR MoD announces new intelligence information on planned Ukrainian provocation targeting 'residential infrastructure'. 23 Feb. 3 DPR soldiers are killed by Ukrainian shelling in the past day (23 Feb. is the traditional Soviet Army day). Opolchenie war correspondent Mag report for the week of 8-14 Feb. notes increased warfare by Ukrainian forces, stating that in the past week, 7 DPR soldiers were killed, 4 soldiers and 3 civilians wounded; 15 DPR soldiers killed from 1 Jan. to 14 Feb. DPR ombudsman report: 2 DPR soldiers killed and 3 civilians wounded from 15 to 21 Feb; 17 soldiers killed and 14 people (8 soldiers, 5 civilian men, and a civilian woman) wounded from 1 Jan to 21 Feb.
A civilian car was hit by an explosion at Yelenovka checkpoint, the driver and his mother were killed, another man wounded. In updated report it is said that driver lost control prior to that (and apparently hit a landmine). 21 Feb. Lavrov: Kiev is preparing another provocation in the Kerch straights. Separately , it is reported 1, 2, 3 with photos and official video, that 2 Ukrainian "Gurza" armored boats and one "Centaur" assault boat with Marines on board departed on 20 Feb, said to be 'for training'. Former Ukrainian Rada deputy Oleg Tsarev: "The first killings on the Maidan were committed by the security service of Klitschko"
17 Feb. Ukrainian 'joint forces' (ATO-2) claim that they discovered and repelled DPR RSG group attack and captured one DPR fighter. Russian sources reported two such similar-sounding claims, 1, 2, expressing doubt that this happened at all, and are those reports describe separate incidents. No photos/videos or further proofs are known to appear in Ukrainian or Russian sources. It is possible that this is propaganda timed with approaching presidential elections in Ukraine. Separately, there has been recent reports of prisoners captured by DPR, some with photos and videos. 16 Feb. JCCC: an elderly woman (1949 DOB) is wounded in Ukrainian shelling of Dokuchaevsk. 15 Feb. DPR ombudsman: in the past week, 7 DPR soldiers were killed, 4 soldiers wounded. 12 Feb. UN meeting on Ukraine, initiated by Russia. It is noted that (obviously) Minsk agreements are not implemented, with Russia blaming Ukraine, and the West + Ukraine blatantly blaming Russia. No apparent breakthroughs. 8 Feb. DPR MOD: 4 DPR soldiers were killed when Ukraine fired illuminating munitions used as incendiary devices, setting fire to a residential house. DPR soldiers were putting out the fire. Ukrainian forces then shelled the area using drone for fire correction, killing 3 soldiers; one more soldier was killed trying to recover the bodies. Also, marked vehicle carrying 'Water of Donbass' crew was shelled with mortars, SPG, large caliber machine guns and firearms; the crew managed to escape. 7 Feb. Water pumping station near Yasinovataya came under fire, with personnel having to take cover in a shelter, when Ukraine fired SPG from Novoselovka-2 in the direction of Vasilevka. Ukrainian representatives at JCCC were unable to ensure ceasefire to evacuate personnel. 6 Feb. DPR- Basurin: UAF intensified shelling, with elections approaching. DPR JCCC representatives: Ukraine resumed shelling of Donetsk, mortar shells fired in the direction of Avdeevka, Spartak (map). Victor Yanukovich, ex-president of Ukraine, who was sentenced to 13 years in absentia by Ukrainian court under state treason charges, gives a long press conference in Russia. His legal team launched a legal challenge to the events of 2014 ('who is to blame for the loss of Crimea', for the 'military coup', and for the killing of innocent protesters and police on Maidan). Continues to talk about wrongful interference of authorities in church affairs, and approaching elections. 5 Feb. Politico runs a story on Vladimir Zelenskiy who is leading some recent polls for the upcoming presidential elections. 4 Feb. Ukrainian ATO participant, call sign 'Oleksa', calls for end of the conflict, resistance to provocations, peace with Russia; published on channel of Alexander Medinsky, who emigrated from Ukraine to Finland. Another ATO participant interviewed earlier, who is also for peace and says that one people in Russia and Ukraine. 3 Feb. DPR MOD claims that Ukrainian army is under instructions to support Poroshenko campaign (hard evidence not presented; response not seen). Ukrainian MoD confirms that 2 Ukrainian soldiers were wounded. 2 Feb. DPR MOD: in the past day, a DPR soldier is killed by Ukrainian shelling, 9 houses in Staromikhilovka are damaged. It is claimed that a western-trained Ukrainian RSG and two sniper pairs arrived to the front lines, possibly for use in provocations near Mariupol. 1 Feb. DPR ombudsman: in the past month, 4 DPR soldiers were killed, 7 people (4 soldiers and 3 civilian men) were wounded. 4733 people were killed according to ombudsman data from the start of the conflict. 31 Jan. Vladimir Zelenskiy is leading in Ukrainian presidential election polls conducted by Ukraine’s Rating Group on Jan. 16-24 and by the Kyiv International Institute of Sociology on Jan. 31. 28 Jan. OSCE special representative Martin Sajdik floats a new peace plan, where some things (specifically, the local elections) are run by UN and OSCE on the ground, including 'police and military components'. DPR FM states that it is 'categorically opposed' to the plan, as it does not follow Minsk agreements and does not give DPR enough say in the process. CONIFA announces draw results for 2019 European Football Cup of unrecognized states, including Donetsk, Lugansk, Abhazia, South Osettia, Nagornyi Karabach (12 teams in total). 21 Jan. British instructors started a training course for Ukrainian Navy in Odessa region as part of a British program "Orbital". That program, supposed to deliver 'defensive training' was 'expanded' in 2018 to include anti-armour, counter-sniping and mortar planning. 18 Jan. DPR Ombudsman: in the past week, 2 soldiers were wounded. From the start of the year, 3 soldiers and 3 civilian men were wounded. In 2018, 162 people were killed, including 5 children, 310 were wounded. From the start of the conflict, 4729 people (4114 men, 615 women) were killed, including 81 children. 17 Jan. First contact group meeting of the year in Minsk. Ukrainian forces fired mortars on Krutaya Balka village, 2 civilian cars were damaged. JCCC representatives showed a photo of one of the cars. 13 Jan. DPR MoD: Ukrainian forces fired small firearms on Zaitsevo, near Gorlovka. Also reporteadly there was a firefight between two Ukrainian brigades, 79 and 80, caused by alcoholic intoxication; one soldier said to be killed. It is said that an Orthodox church of UOC-Moscow Patriarchate in the village of Krasnovolia, Manevichsky district, Volyn region, Ukraine was seized by supporters of the new Ukrainian Orthodox church (subordinate to Constantinople patriarchate). 12 Jan. Archimandrite Michael (Anischenko) is appointed head of the Stavropigiya in Kiev by the Synod of the Ecumenical Patriarchate chaired by Patriarch Bartholomew (romfea.gr), (fakty.ua). 10 Jan. Donetsk News Agency reports shelling from Ukrainians at Northern Golovka and Yasinovataya with 3 'Water of Donbass' workers arriving to clean snow injured, their vehicle burned. 5 Jan. Patriarch Bartholomew signed Tomos (full text) on establishing autocephalous Orthodox Church of Ukraine (ПЦУ), subordinate to the Ecumenical Patriarch (lit. 'recognizes as its head the Holy Apostolic and Patriarchal Ecumenical Sea". Declares rights of the Ecumenical Throne to the "Exarchate in Ukraine and sacred Stavropygia"). DPR MoD reports on two failed Ukrainian RSG attempts which resulted in Ukrainian casualties (Rus.)(robo-Eng.). 2 Jan. It is reported that Ukraine is secretly preparing civil lawsuits on ending leases at the two main sites, Kiev-Pechersk Lavra and Kremenets-Pochayevsk Reserve, to Ukrainian Orthodox Church of Moscow Patriarchate. Victor Kovalskii, 81, one of designers of 'Mria' aircraft, is beaten up in Kiev in a mistaken identity incident. 1 Jan. Attempted sabotage of a railway bridge in Donetsk reported, a pile was damaged but the bridge is still standing. Repair crews installed temporary supports. 31 Dec. 11.59 pm on the New Year eve, showman Vladimir Zelenskii announces that he is running for the president of Ukraine. 29 Dec. Russia extended the list of banned agricultural and industrial goods from Ukraine. (Back in 2016, with Ukraine signing the EU association agreement, Russia and Ukraine sanctioned each other). 27 Dec. LPR chips in saying they too discovered Ukrainian attack plans. Meanwhile the contact group tries to have a ceasefire for the Orthodox Xmas, from Dec. 29. Russell "Texas" Bentley reports from the frontlines and a shop destroyed (Dec. 14) by Ukrainian artillery in the village of Kominternovo. 26 Dec. Martial law in Ukraine ended (this is not too significant as either renewal or imposition at a later date, if so decided, would require Rada vote). 17 Dec. Shelling, quest for provocations continues. DPR MoD updates, Rus. 1, 2, robo-Eng 1, 2. Basurin: Ukrainian propaganda even named the exact start date of our offensive - Dec. 24-25, which is not surprising. Poroshenko's plans are absolutely transparent. He needs a reason to extend the martial law ending on Dec. 26 in Ukraine. And he is actively looking for it. It is possible that on Dec. 24-25, UAF themselves will attempt to attack. 15 Dec. Unification congress in Kiev. 10 Dec. Urgent, passionate, and very detailed new appeal by Basurin telling that there is Ukrainian plan of a provocation followed by an attack, aimed to be completed by scheduled for Dec 15 unification meeting of breakaway Ukrainian churches. Requires immediate and sustained attention. (Rus), (robo-eng), (humans' Eng.). Noted: text is pronounced in strong/determined/passionate/straight in the eye manner, unlike regular conferences. Updates. 1.DPR MoD: UAF mined several roads, possibly preparing a provocation targeting public transport. Several carts with chemical protective kits delivered to UAF-guarded location. 2.SBU accused the governor of the main Kiev-Pechersk Lavra of the preparation of 'pro-Russian provocations', interrogated him, prior to the approaching 'unification gathering' (Rus)/ (robo-Eng), (SBU-Ukr). (3) 00:10 14 Dec, UAF fired 5 20 mortar shells + AGS, RPG and large caliber machine guns on Shirokino and Sakhanka, 29 AGS shots a day earlier on Gnutovo. (4) Basurin: UAF formed first echelon for an offensive operation, stretching 50 km Vinogradnoe (Mariupol) to Staroignativka (Volnovkha). DPR forces are on high alert. 7 Dec. Regular DPR MOD update provides a detailed account of their available evidence of Ukrainian forces preparations for a provocation or warfare. We discuss similar material on talk page. While we cannot certify provided information, this release requires immediate attention and study. Full robo-translation +video linked. Unmarked tank convoy in Slovakia said to be headed to Ukraine. 6 Dec. Ukrainian Rada voted to terminate treaty of friendship with Russia (277 for, 20 against, 34 not voted, video), effective Apr.1, 2019, after a draft resolution was introduced by Poroshenko. The treaty included respect of territorial integrity, in particular. 5 Dec. Putin on reasons why he presently does not want to discuss recent crisis with Poroshenko: does not want to take part in his reelection campaign; Poroshenko 'skillfully creates crisis, then blames Russia, then demonstrates how he solves the crisis, pretending it's not him to blame' (video). Presidential front-runner Yulia Timoshenko is in USA to present herself for photographing at the Atlantic Council meeting and with Kurt Volker (in addition to unworkable video presentations featuring herself over dramatic musical background). 3 Dec. Volunteer: Ukrainian tank company arrived to the port of Mariupol (report and photo). 1 Dec. Basurin/DPR: according to DPR intelligence, UAF plans a large scale attack in December, evidenced by three elite brigades (79 airborne assault, 36 Marine and 128 mountain assault) deployed in Mariupol direction. Bezsonov/DPR: Kiev deployed near Donetsk a paratroopers battalion trained in city warfare, + military equipment and ammunition. Poroshenko: troops training and redeplyment will be conducted, in martial law regions, reservists and territorial defense will be called up for training, defense industry enterprises are switching to a special regime of operation -Ukrinform. Ukrainian MoD: starting from December 3, a series of large-scale events with reservists and soldiers will begin (Ukr)(Robo-Eng). Poroshenko announced end of ATO and start of 'joint operation of armed forces', which is aimed at 'defending territorial integrity' and will only end 'when the last piece of Ukrainian land is liberated, including Crimea', which is somehow supposed to happen by 'political-diplomatic means'. 'Suburbia of life', about the effect of the war on life in small villages and towns. Shelling, destruction, economic hardship. Slow running, in Russian. Sept. 29, 2016. Aftermaths of Ukrainian shelling of the village Zheltoe (Yellow), LPR, 29 Nov. 2016 lug-info. Note on sources. At present, pro -Ukrainian and pro-Russian sources more often than not offer opposing claims on events, and a choice needs to be made. Currently factual part of reporting by pro-Russian sources appear more accurate, complete, and closer to truth, out of the two available alternatives. It is also less known, as the other side has greater support by the Western mass media. For that reason, a lot of reporting here is based on Russian sources. It is not done for the sake of supporting any pre-determined narrative. If and when Ukrainian sources appear more accurate, they will be used without a reservation. Some Ukrainian source reporting is very good, for example Tatyana Montyan numerous videos, some of them translated, are spot-on and at times appear closer to reality than any pro-this or that narratives. However the bulk of Ukrainian media is unreliable, and often just unbelievable, not passing cross checks (e.g. as was illustrated numerous times by well-read on both sides Ukrainian journalist Anatoly Sharii); or else, is filled with hate and may cheer more people harmed or killed (any of such sort, from any side, is totally unsupported here). DPR: DAN news (Eng). ; DPR MOD, Russ. ; DPR ombudsman, Russ. 22.7.15 Under-100 mm weapons withdrawal was agreed Poroshenko statement: ' I hope it will be the real beginning of the ceasefire'. 12.2.15 Two documents were agreed: on measures on implementing Minsk protocol (English language PDF here). Maidan snipers February, 2014 Analyzing the mysterious February, 2014 shootings that helped demonize Ukraine's government at just the right time. Odessa Trade Union massacre May 2, 2014 Analyzing the killing of dozens of pro-federalism activists in Odessa, which the civilized world shrugged at and ignored. (based on numerous videos of the event, documented authorities response, and witness interviews; still mostly on talk pages). Followed from the very beginning. However still remains mostly on talk page, sub-pages, and sub-page talk pages. A very similar chain of events like years before in Ras Al-Ayn (see below), only this time it made the news (months after we started the article). Not least because this time, the attackers call themselves part of ISIS, the "newly arrived" enemy of all that's good and decent. Ras Al-Ayn, directly at the Turkish border in the north-east, early November 2012: The Kurdish dominated and mostly self-governed town gets assaulted by hundreds of Islamist fighters coming across the border from Turkey, under the eyes and with help of the Turkish military. After typical sectarian assaults on the civilian population, Kurdish militia takes up the fight against the foreigners. In the process of the following weeks, the town sees shelling by both the Syrian and the Turkish army, several defeats of the Islamists with retreat behind the Turkish border, and finally a fragile truce. On January 16, again large groups of foreign fighters with tanks cross the Turkish border and heavy clashes break out. After a month of heavy fighting, another peace agreement is signed on February 17. Five months later, following an Islamist attack on female Kurdish fighters, heavy clashes lead to the final conquer of the border station by the Kurds, which leads to increasing tensions in other parts of the region. 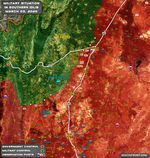 When news of this alleged massacre reached the media, it came with alarming numbers of up to 300 civilians murdered in the small village of Tremseh northwest of Hama. In the following hours and days, both pro- and anti-government sources helped to clear the picture of what is now mostly called the "Battle of Tremseh" between the army and anti-government fighters who had used the village as their base for operations in the region. The real death toll seems to be some civilians caught in the crossfire and a couple of dozen killed anti-government fighters. In addition, many including foreigners were arrested and their arms and equipment confiscated. This page was last edited on 7 March 2019, at 14:58.